Sarah, whose name has been changed to protect her identity, was sitting in her 8 a.m. criminal justice reform class waiting for the clock to hit 9:25. As the minute hand inched towards the five, she and another black classmate were suddenly called on by their professor, who requested their opinions on mass incarceration. This case was reported to the Center for Diversity and Inclusion, a campus resource committed to respecting and valuing diversity on campus, according to their website. But, the investigation has since been closed. Although the CDI is an important part American University’s diversity and inclusion efforts, there is still noticeable tokenism of students of color. Lucky Sasiphong, a junior at AU and vice president of the Asian American Student Union, said their experience is similar to Sarah. Sasipong explained how problematic this is, because she recognizes that she does not speak for all Asian-Americans due to their diverse experiences. AU has been slowly increasing the diversity of their student body. Today, 43.9 percent are now are students of color, which includes white-passing Latinx individuals and white-passing visa holders. The official statistics on AU’s demographics cannot be found on AU’s website, but according to College Factual, Latinx students are now 12.1 percent at AU, followed by black students at 6.8 percent, and Asian students at 6.2 percent. The remaining 8.8 percent did not report their race or ethnicity. 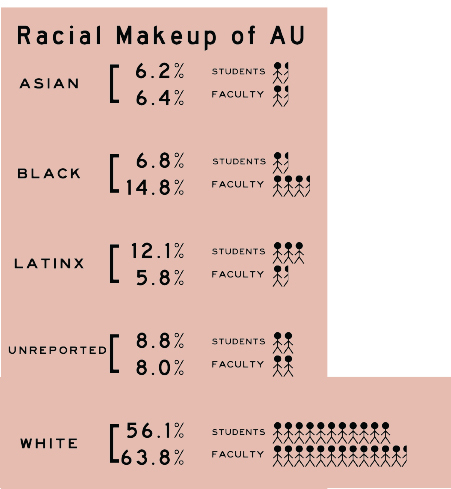 AU faculty is less diverse than the student population, as only 34% identified as an ethnicity other than white. The largest minority faculty group identified as black, which is 14.8 percent; significantly greater than the black student population. The second largest group is Asian as 6.4 percent, followed by Latinx at 5.8 percent. The remaining 7 percent did not report their ethnicity. At AU, faculty members are teaching more than basic academic subjects like science and math; they’re discussing subjects like mass incarceration, police militarization and global inequality. Professors are then faced with the challenge of teaching these topics to students of color on a predominantly white campus. This is the case for Professor Alexander Clayton, who teaches Introduction to Systems of Justice. However, Professor Clayton does believe his method has flaws. Clayton’s approach is based primarily in his hope to increase participation from students of color in class. Professor Nuku Ofori, an adjunct professor in the Sociology department, offers a different method. “There is a level of consciousness as a black male teaching mostly white students,” Ofori said. “This method disarms students and disarms defensiveness,” Ofori said about this, based off of his experience at Georgetown University. Professor Ofori believes his method allows white students to engage in conversations about race and inequality without feeling the need to defend themselves. “I can then acknowledge race and ethnicity as complementary to these issues…. White students can still speak on these topics about race and inequality,” Ofori said. One little-known program organized by the CDI is the Summer Transition Enrichment Program, commonly known as STEP. Admissions handpicks around 100 students whom they believe need extra support transitioning into college and gives them a choice: attend STEP for eight weeks in the summer, or forfeit your acceptance. “[Admissions] selects students for STEP who have demonstrated excellence throughout their application but may have attended an under resourced high school,” Andrea Felder, Provost for Undergraduate Admissions, said. “They may be first in their family to attend college, they may come from a rural/urban community, or have otherwise shown they could use the additional support before beginning their academic career at AU,” Felder said. While the selection process is undisclosed to both the participants and the CDI, there are commonalities among participants. 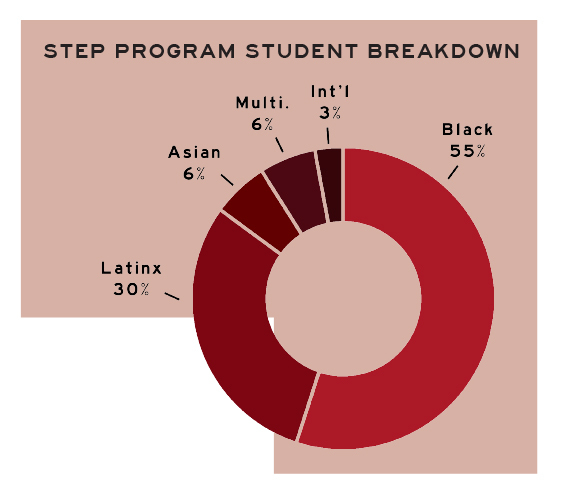 According to Office of Enrollment, the 2018 STEP class was 55 percent black, 30 percent Latinx, 6 percent Asian, 6 percent multiracial, and 3 percent international students. There was a total of 33 students enrolled in STEP this year. To this day, Martinez and other participants still are not sure why they were chosen and were never given an explanation by the school. AU diversity rates among the student population are rising. Sasiphong discussed her excitement about the growing Asian-American Pacific Islander population at AU. Sarah also commends AU, stating that she does notice the effort, especially with the CDI. “CDI does a lot and they’re great to educate and to make communities,” Sarah said about the programs that CDI offers, including their intergroup dialogues and workshops. However, predominantly white institutions like AU, even with resources like the CDI and STEP, struggle with supporting students of color without them feeling segregated or tokenized. “Although [my professor] felt like they were giving us a platform to speak, we have hands that we can raise,” Sarah said.